All India Institute of Medical Sciences recently releases an employment notification to hire 231 eligible and capable aspirants for Programmer, Sanitary Inspector, Lab Attendant, Technical Assistant Posts. Candidates who are looking for govt jobs in AIIMS Bhopal can apply for this recruitment notification by submitting offline application form before the closing date i.e. (15th February 2019). Candidates can download format of application of through official website www.aiimsbhopal.edu.in & fill all information into form and attach the copies of all the necessary documents with the application form Send the application to the address given below in the post along with the required documents. Educational Qualifications For AIIMS Bhopal Jobs 2019: Candidates who have completed 10th, ITI/Diploma certificate in Refrigeration and Air Conditioning/Electrician/Plumber/Mechanical Engg, 12th, Diploma in Medical Lab Technology/Pharmacy, B.Sc. (Medical Records), BE/B.Tech (Comp. Sc./Comp.Engg. ), Graduate Degree or equivalent examinations from the recognized university or institution with required minimum marks can apply for AIIMS Bhopal jobs 2019. There is no fee for PH/ST/SC/Women and Physically Challenged candidates. The age of candidate who is willing to apply for AIIMS Bhopal must be between 25 to 35 Years (Post 1), 18 to 30 Years (Post 2,6,9,12,13), 21 to 27 Years (Post 3,8), 18 to 35 Years (Post 4), 18 to 27 Years (Post 5,11,16), 21 to 30 Years (Post 10), 18 to 40 Years (Post 15). The age of candidate who is willing to apply for AIIMS Bhopal should not be more than 35 Years (Post 7), 30 Years (Post 14). 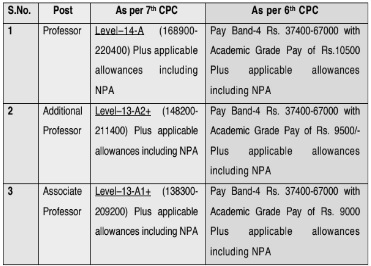 Pay Scale: Qualified Candidates for AIIMS Bhopal vacancies will get a pay scale of Rs. 32,270/- (Post 1), Rs. 40,970/- (Post 2), Rs. 27,000/- (Post 3,4), Rs. 24,500/- (Post 5-10), Rs. 20,000/- (Post 11-16) Per month. Contenders for All India Institute of Medical Sciences Jobs 2019 are selected based on their performance in Multiple-Choice Question (MCQ) Test and Skill Test. First of all you have to logon to the Official website of organization that is www.aiimsbhopal.edu.in. All India Institute of Medical Sciences recently releases an employment notification to hire 119 eligible and capable aspirants for Professor, Associate Professor Posts. Candidates who are looking for govt jobs in AIIMS Bhopal can apply for this recruitment notification by submitting online application form before the last date i.e. (6th March 2019) through official website www.aiimsbhopal.edu.in. Educational Qualifications For AIIMS Bhopal Jobs 2019: Candidates who have completed Post Graduation Degree in MD/MS, M.Ch. for surgical super-specialities/ D.M. /M.Ch. in the respective discipline/subject from the recognized university or institution with required minimum marks can apply for AIIMS Bhopal jobs 2019. General/OBC Category candidates have to pay Rs. 2000/-. There is no fee for PWD (Persons with Disability)and Physically Challenged candidates. The age of candidate who is willing to apply for AIIMS Bhopal should not be more than 58 Years (Post 1,2), 50 Years (Post 3). Contenders for All India Institute of Medical Sciences Jobs 2019 are selected based on their performance in Personal Interview. Opening date to apply : 21-01-2019. Closing Date for Submission of Application Form : 06-03-2019.